Sweets used in chanoyu can be broadly divided into omogashi ('main sweets', also called namagashi) which are moist sweets, and higashi (dry sweets), also called sogashi. At formal tea event omogashi are eaten with thick tea and higashi are eaten with thin tea, but at gatherings where only thick tea is served, both omogashi and higashi are sometimes served, and at very simple gatherings with only thin tea just one kind of sweet, omogashi, is served. Among omogashi, there are nerikiri, which are very sweet, and which are called 'konashi' in Kyoto, including manju (steamed dumpling with bean jam filling), mushigashi (steamed sweet bean jelly) and so on, and they have shapes and names to go with the seasons and annual events. 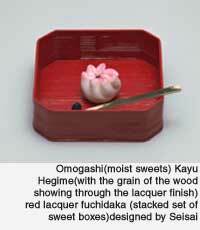 Omogashi are eaten at formal tea event and are served in fuchidaka (five-tiered stacked boxes). Each guest receives one box with an omogashi in the middle. There is one kuromoji sweet pick for each guest and these are used to put the sweet onto the kaishi paper from which it is eaten. Two kinds of higashi are normally used, ones that are 'pressed or moulded into a certain shape' and ones that are like candies, made with sugar that are eaten with rice crackers. Omogashi that are eaten with thin tea are usually served in lacquered food containers called jikiro in winter, and in summer they are served in ceramic containers. When thin tea is served informally, a single sweet is served on a small dish called a meimeizara with a kuromoji sweet pick. It is possible to serve tea very simply with just dry sweets.